Edmonton Hot Tub Repairs and Servicing Find out why the Spa Spot’s customer service is second-to-none. More than Edmonton’s best Hot Tubs retailer, the Spa Spot has built it’s reputation on our expertise and customer service. We don’t just sell hot tubs, we provide total hot tub support and accessories. We service hot tubs regardless of which location it was purchased form, and we’re so dedicated to providing the best service we offer free no obligation estimates. Even the most reliable hot tub needs an occasional replacement part to stay working in top order. That’s why the Spa Spot supports its broad selection of Edmonton hot tubs with an equally broad selection of parts. 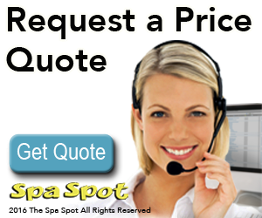 If you find yourself in need of a particular part, you can trust the Spa Spot to help you out. Plus, in the rare event we don’t have your part on hand, we’ll find a way to get it for you. It’s all part of our commitment to flawless customer service. The Spa Spot proudly stands behind all our products, and offers a full suite of services to support your new hot tub. We offer no-obligation repair estimates, and will repair any make and model of hot tub at any of our northern Alberta locations, regardless of where you bought it. From something as minor as balancing your hot tub’s water to assisting with warranty issues and claims, our dedication to being Edmonton’s best hot tubs retailer means we’ll happily help with any and all service issues. From covers to chemical kits, the Spa Spot has everything you need to complete your new hot tub experience. Whether you’re looking for a leading defoamer, replacement filters, or even scent packs, we’ve got the hot tub accessories and parts to help create the perfect, personalized hot tub experience.